Readers will get to follow and be inspired by the strong yet endearing Eloise as she struggles to survive on her own. The road to salvation can be full of adventures. Survival and determination are one teenager’s guiding principles to rebuild her life and find salvation in the historical romance fiction book “Eloise of Westhaven: Not Just a Kid (Volume 1)” by Jean Archambault-White. Set in the early days of the American West, where the industrial age is beginning to flourish, readers will be transported to the time where horses and ranches were still common sights. At the dawn of the industrial age, one teenager, Eloise Jackson, struggles to turn her life around after being orphaned at an early age. Hardships and unfortunate circumstances have claimed the lives of Eloise’s family, from her father and brother and then her mother. The Cravits family have taken her in and she shows them her gratitude by displaying her charm, wit and, strong work ethic in helping out in their store. She soon finds herself as a new member of the Cravits family. She eventually becomes a nanny to the wealthy mayor’s two difficult children. Just when things seem to be getting better for Eloise, she still is not out of the woods yet. She encounters a gang of outlaws who might threaten all the good things she has established. She will use her wit and skills to stop them and get her life back on track. The story is nevertheless exciting as Eloise is experiencing the adventures and misadventures of growing up and making it through life. And the best part yet of Eloise’s story? She finds love amidst the hopelessness and struggles in her life. “Eloise of Westhaven: Not Just a Kid (Volume 1)” is just the first of a multi-volume story that chronicles the life and struggles of Eloise Jackson. Jean Archambault-White has done a terrific job of opening a series of stories with an exciting and anticipation-driving first volume. To get a hold of this exciting first series, the 2018 Frankfurt International Book Fair is the event to be at this coming October 10 - 14, 2018 in Frankfurt, Germany. 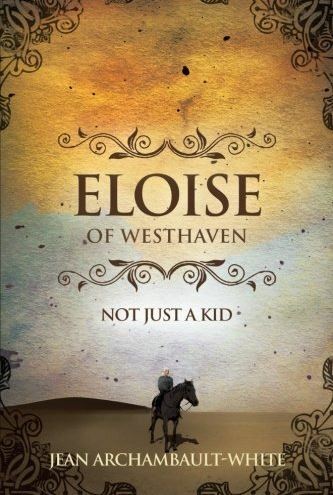 Copies are available at WestBow Press (https://www.westbowpress.com/bookstore/bookdetail.aspx?bookid=SKU-000632453) and Amazon (https://www.amazon.com/Eloise-Westhaven-Not-Just-Kid/dp/1490800395/). Jean Archambault-White is a seasoned writer, having worked as a columnist, technical writer, and freelance writer. First published at fifteen years old, she has had more than thirty years of experience in writing and editing across multiple genres. She and her husband currently reside in Palmetto, Florida.